Join Twinkle just a mile down the road from her beautiful home at the First Universalist Church of Pittsfield for an Outside-the-box Service this Sunday. 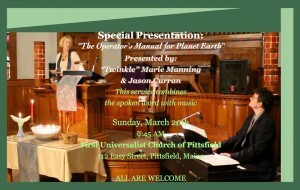 see First Universalist Church of Pittsfield Facebook posting. For other services by Twinkle and Jason, visit here.